DarwinEssay.net welcomes the visitors with a trendy website, filled with information about the service. 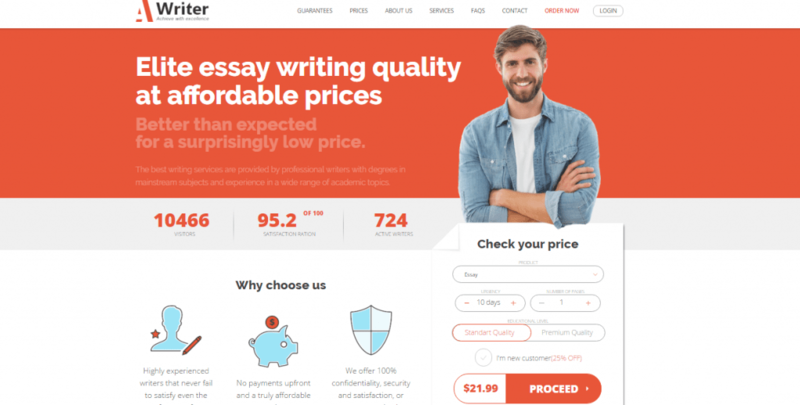 Once you open their homepage, you will notice that this company promises to deliver ‘the best writing essays ever in time, creative and sound’. We found their main statement to be very confusing and strangely formed, which is why we decided to further evaluate this company and see if they deliver quality content. There is no separate page for services, but you can check the full list in the calculator on the homepage. From what we could see here, DarwinEssay.net offers a wide range of academic services, which makes it a good choice for those in need of a regular provider. You can find all kinds of papers here, starting from essays to dissertations. The pricing of this company starts at only $9.97 for an undergraduate level and deadline of 14 days and ranges up to $56 for professional academic level. These prices apply to ‘writing from scratch’, which means that all written papers come at a same price. These are all affordable pricings, except for the admission help pricelist. If you order a single page of admission content from this service, you can be charged up to $197 per page! First orders come with a 10% discount. The company has no loyalty program, which is very disappointing. Instead, they have 5% or 10% one-time discounts, for which you have to make $500 or $1000, respectively! However, even their bad discounts come with a trick. In order to enjoy any discount or special offer, you must have an order that exceeds $30! Considering that the starting prices are affordable, we decided to forget about the bad discount policy and place our order with the service. We ordered a term paper with a deadline of 6 days and got a nice price. However, we must say we were very disappointed by the content, since our paper was clearly not written by a native English speaker. The term paper we got confirmed our fears – the company delivers content full of mistakes, as we could notice from the numerous errors in their website content. If you have any questions or concerns, you can contact the company via e-mail, phone number or their 24/7 live chat. We would not recommend the phone option, since the agents who answer it speak very bad English. Not only did Stella, the phone agent, fail to answer our question, but she actually could not understand us half of the time! Darwinessay.net does offer a wide range of services that come at a fair price, but they have a very bad discount policy and no loyalty program whatsoever. Considering that there are many services who do offer such advantages, students are very likely to look for other companies for their academic assignments. We simply cannot recommend this service, mostly because of the paper we received. The company probably works with non-native writers, which results in numerous mistakes and incomprehensible content.